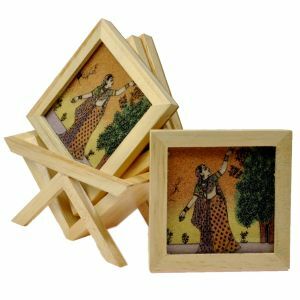 This set of four square shaped Tea Coasters and one holder to keep them has been handcrafted from wood. The beauty of this item is gemstone painting inside each coaster. The painting is hand made with finely crushed real gemstones on a glass base. This utility item can be used as a show-piece in your drawing room or on your dining table. It is also an ideal gift for your friends and relatives. The gift piece has been prepared by the master artisans of Jaipur.